Heron is the common name for any of the long-legged, long-necked, wading birds comprising the family Ardeidae of the order Ciconiiformes. Some in this family are more specifically designated egrets or bitterns instead of herons. 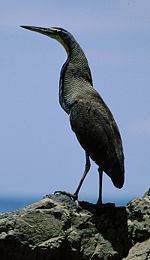 Within the family, all members of the genera Botaurus and Ixobrychus are referred to as bitterns, and—including the zigzag heron or zigzag bittern—are a monophyletic group within the Ardeidae. However, egrets are not a biologically distinct group from the herons, and tend to be named differently because they are mainly white or have decorative plumes. Herons are similar in appearance to cranes, but are distinguished readily in flight because they fly with their necks folded back, whereas the unrelated cranes fly with necks outstretched. Herons provide values for the ecosystem and for humans. Ecologically, they play roles in food chains, consuming fish, frogs, and invertebrates, while being preyed upon by bobcats and other carnivores. For people, the beautiful form, graceful flying, and unique behaviors of herons add to the human enjoyment of nature, and their beautiful long feathers, such as of egrets, were once popular as decorations in women's hats. Herons have a long, straight, pointed bill, long neck, long legs, and broad wings. Their plumage—which is usually white, gray, or bluish-gray, but may be other colors such green, black, or purple—is often soft and drooping. Herons are one of the groups of birds with powder down, a special type of down feathers, which differ from the usual down as they are exceptionally fine and produce a dust between the frons. The world's largest heron is the goliath heron (Ardea goliath), found in sub-Saharan Africa, with smaller numbers in Southwest and South Asia. The standing height averages over 1.4 meters (4.5 feet), with a wingspan of at least two meters (seven feet) and a weight of about four kilograms (nine pounds). In contrast, the green heron (Butorides virescens) has an adult body length of only about 44 centimeters. Herons tend to be smaller than the similar-looking cranes (Guidae family of the order Gruiformes), and typically have a thinner bill. They also lack the elevated hind toe of the cranes. Both fly with their legs trailing, but the cranes fly with necks extended straight out, and herons with necks retracted. Herons also commonly stand with their neck bent. Likewise, herons resemble birds in some other families, such as the storks, ibises, and spoonbills, but differ from these in flying with their necks retracted, not outstretched. Herons are found worldwide, on all continents except Antarctica, and commonly feed on fish, frogs, and other aquatic animals in shallow parts of freshwater ponds, lakes, marshes, and swamps. The members of this family are mostly associated with wetlands. 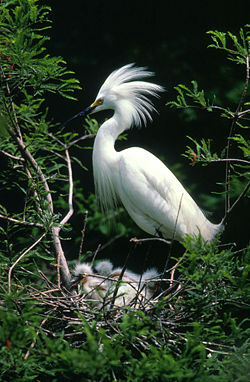 Some, like the cattle egret and black-headed heron, also take large insects, and are less tied to watery environments. Some members of this group nest colonially in trees, others, notably the bitterns, use reedbeds. In February 2005, the Canadian scientist Dr. Louis Lefebvre announced a method of measuring avian IQ in terms of their innovation in feeding habits. Herons were named among the most intelligent birds based on this scale, reflecting a wide variety, flexibility and adaptiveness to acquire food. The classification of the individual heron/egret species is fraught with difficulty, and there is still no clear consensus about the correct placement of many species into either of two of the major genera, Ardea and Egretta. Similarly, the relationship of the genera in the family is not completely resolved. For example, the boat-billed heron is sometimes classified as a heron, and sometimes it given its own family Cochlearidae; nowadays, it is usually retained in the Ardeidae. Analyses of the skeleton, mainly the skull, suggested that the Ardeidae could be split into a diurnal and a crepuscular/nocturnal group that included the bitterns. From DNA studies and skeletal analyses focusing more on bones of body and limbs, this grouping has been revealed as incorrect (McCracken and Sheldon 1998). Rather, the similarities in skull morphology reflect convergent evolution to cope with the different challenges of daytime and nighttime feeding. The night herons could warrant separation as subfamily Nycticoracinae, as was traditionally done. However, the position of some genera (e.g. Butorides or Syrigma) is unclear at the moment, and molecular studies have until now suffered from a small number of studied taxa. Especially the relationship among the ardeine subfamily is very badly resolved. The arrangement presented here should be considered provisional. Other prehistoric and fossil species are included in the respective genus accounts. McCracken, K. G., and F. H. Sheldon. 1998. Molecular and osteological heron phylogenies: Sources of incongruence. Auk 115: 127–141. Retrieved November 5, 2007. Sheldon, F. H., K. G. McCracken, and K. D. Stuebing. 1995. Phylogenetic relationships of the zigzag heron (Zebrilus undulatus) and white-crested bittern (Tigriornis leucolophus) estimated by DNA-DNA hybridization. Auk 112(3): 672-679. Retrieved November 5, 2007. Sheldon, F. H., C. E. Jones, and K. G. McCracken. 2000. Relative patterns and rates of evolution in heron nuclear and mitochondrial DNA. Molecular Biology and Evolution 17(3): 437–450. Retrieved November 5, 2007. This page was last modified on 22 December 2017, at 20:16.